CLEVELAND, Ohio -- There was a ding on Lee Owens' cellphone. The Ashland University football coach clicked on a message from a friend, a link to the New York Times. "It was Jamie," said Owens. "There was a picture of him in the New York Times!" 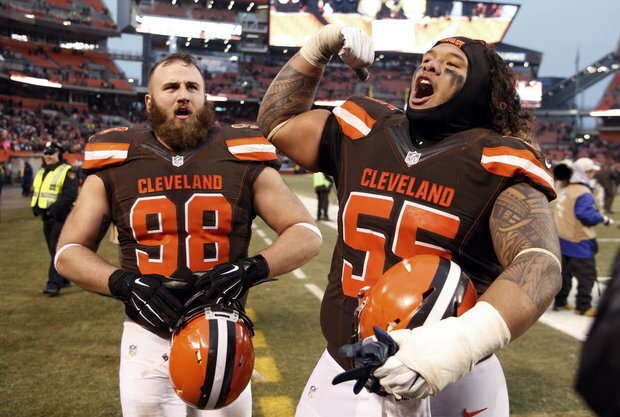 Jamie is Jamie Meder, the Browns defensive lineman who blocked a fourth-quarter field goal in Saturday's 20-17 victory over San Diego. Meder was one of the stars in the team's first victory of the season, helping them avoid a winless season and all the grief that would accompany it. "The Pierogi Prince of Parma," is what Browns All-Pro tackle Joe Thomas affectionately called Meder. After the game, Thomas said Meder "is a man after my own heart ... he is a guy who has fought his way from the bottom to make a huge impact on this team." Part of the reason Meder is in the NFL is Lee Owens. Meder was a good player at Parma's Valley Forge High School, but needed to put his academics in order for college. He attended Cuyahoga Community College for a semester, then enrolled at Ashland. A Division II football program, Ashland has been successful because Owens and his coaching staff find players who are missed by larger colleges. For example, Meder could have attended a junior college with a football program. From there, he probably would have been recruited to play at the Division I level. "There's no doubt about that," said Tim Rose. "The first time I saw him, I knew Jamie had Division I talent." Rose is Ashland's defensive coordinator. He coached at the Division I level for 29 years, including six season as the head coach at Miami of Ohio. Meder wanted to go Ashland because Owens had recruited him in high school and had waited for him to raise his grades at CCC. "After he enrolled, we had a workout with him," said Rose. "It was just speed, strength, agility. He had it all. He was a wrestler, and that really helped his footwork." Owens made sure Meder was set up with study tables and tutors so he'd make the grade in college. "We wanted to make sure Jamie graduated," said Owens. "Only once did I have to get on him hard about school. It was right before his first college game. He missed a couple of classes. He was supposed to start, but I sat him out a quarter." Harsher penalties would have followed, but Meder got the message. He played four years at Ashland and was a Division II All-American as a senior. "Unlike some kids who have a shot at getting drafted, Jamie didn't leave school early," said Owens. "He made sure he stayed and graduated. He worked out hard with us." In scouting reports after his senior season, Meder was measured at 6-foot-2, 293 pounds. His 40-time was listed at 5.05 by NFL.com. CBSsports.com's Dane Brugler had him rated as the No. 33 defensive tackle in the 2014 draft. Profootball Weekly's Nolan Nawrocki labeled Meder "a priority free agent." Owens was an assistant coach at Ohio State (1992-94) and then the head coach at the University of Akron (1995-2003). He kept telling scouts about Meder. "In the end, I think they couldn't get past the fact Jamie was at Division II," said Owens. "They didn't get to see him on tape against teams such as Ohio State or Alabama." Owens said once Meder played a season at Ashland and showed his talent, "he could easily have transferred to a D1 school, sat out a year and then played. But that's not Jamie. He is a loyal guy." After his senior season, Owens suggested Meder meet with Cleveland-based agent Neil Cornrich. It was an excellent pairing. Cornrich found Meder to be "a great guy, quiet, hard-working. He's so humble." After Meder was ignored in the draft, Cornrich talked to several teams. Baltimore defensive coordinator Dean Pees was intrigued by Meder. So was General manager Ozzie Newsome. Meder signed with Ravens, made it through rookie camp and opened the season on Baltimore's practice squad. Meder was cut by the Ravens on November 10, 2014. One of the good moves by former Browns general manager Ray Farmer was to sign Meder the day after he became available. Meder has slowly worked his way into the Browns defensive line scheme. He played in one game in 2014, and then appeared in all 16 games last season. He has played in all 15 games this season, starting 14 times. He is now 308 pounds, and definitely will have a nice pro career if he stays healthy. Owens gushes about how Meder consistently stays in contact with Ashland. He has attended some spring games. He has appeared in a video for the school. "He has signed lots of autographs. He does all the right things," said Owens. At Valley Forge, Meder finished second in the state as a high school wrestler. Rose talks about Meder having "a certain spirit. He was a high school wrestler and he has that relentless wrestler's mentality." Owens has been the head coach at Ashland for 13 years. His record is 98-44 and four times he's led the Eagles to the D2 playoffs. Owens relies on players from Ohio. His quarterback is North Royalton's Travis Tarnowski, who has set a school record for touchdown passes. "It's great to see what Jamie is doing with the Browns because he's a great fit for Cleveland," said Owens. "He's earned everything. He loves playing here. We're so proud of him."